Microwave cherries and 2 tablespoons of water in a small microwaveable bowl for 2 minutes. Drain. Melt morsels and almond bark coating in heavy saucepan over low heat. Remove from heat; stir in cherries and pistachios. Spread mixture onto a wax paper lined 15x10 inch jelly roll pan. Place another sheet of wax paper on top and press down to spread evenly on pan. Chill 1 hour in the refrigerator or until firm. While the colors red and green are adorning the stores and your neighbors' houses, they rarely make an appearance in our food without the aid of some food coloring or other artificial substance. This Red and Green Pistachio Bark showcases the colors of the season -- and in the way that nature intended. 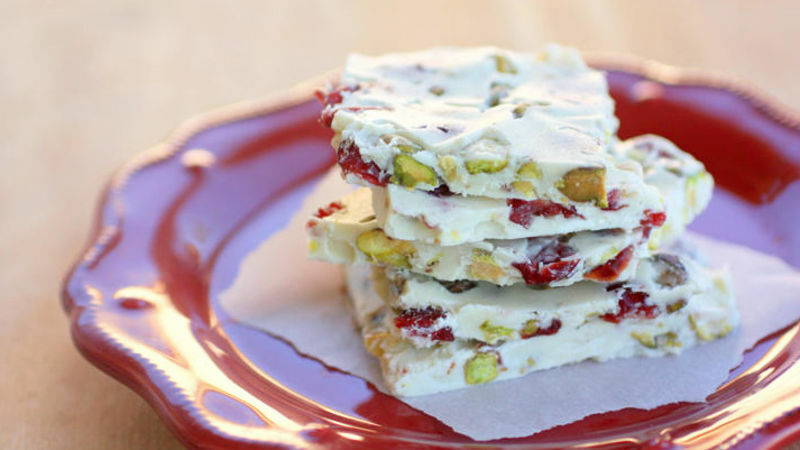 The bright red dried cherries and salty green pistachios naturally create a beautiful and festive white chocolate bark that would be perfect for a holiday plate for your friends and neighbors. And unless you forgot to buy shelled pistachios and had to shell the whole bag of pistachios yourself…ahem…, this treat should take you under five minutes to make. It makes enough bark for an army so you can easily share this treat. Tip: Spreading the pistachio bark mixture onto the pan can be a little tricky. An easy way to manipulate the mixture is to not only line the bottom of the pan with wax paper, but also place a wax paper sheet on top. Then you can just pour the pistachio bark mixture in the middle of the pan, place the sheet of wax paper on top, and press down to evenly distribute the bark on the pan without all of the sticky mess.